I could have been intimidated entering a high-end clothing shop in my local town, dressed in mumsy, distinctly non-designer attire. But I was made to feel warm and welcome. The stylish owner greeted me. She engaged me in conversation by asking me about my day. A few open-ended questions later and we were chatting like old school friends. The shop was light and airy with neutral colours abound. As we chatted, the owner pulled clothes from a beautifully arranged and gleaming rack. She casually explained how I could put outfits together and make them work in my everyday life. I fell for the shop owner’s sales technique hook, line and sinker. As a result, I left the shop with a beautiful outfit, having spent much more than I intended. But I have to hand it to the shop owner. She executed the sale with a tried and tested process that anticipated my questions and overcame any objections I had. I wanted to look stylish, but my lifestyle was governed by the school run. As well as wanting to look stylish, my clothes need to be durable, easy to clean and require minimal looking after. My clothes need to be versatile. I want to be able to dress them up and down. If I’m spending money on clothes, I need convincing they’ll last a long time. I’m not sure this is right for me. You can see how persuasive this sales technique is. It’s the same technique you can and should use when writing marketing communications copy. 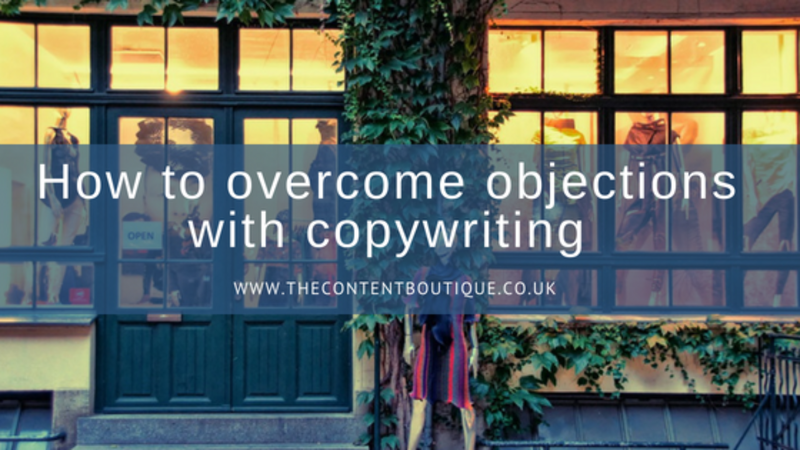 You see, to truly be effective, your copy needs to overcome objections to taking action. With this in mind, before putting pen to paper, put yourself in your customers’ shoes and brainstorm any questions or objections your customers may have when buying your product or service. Better still, talk to your existing customers. Ask them if they had any concerns before deciding to buy from you. The purpose of copywriting is to get your readers to take action. So take some tips from this sales savvy shop owner. Reassure your customer in your marketing copy that it’s making the right decision. Show you’ve thought about and can answer its concerns. Do this, and you’ll make them an offer they cannot refuse. If you would like help writing marketing copy that overcomes objections, then drop me a line to get information about pricing.